One and two bedroom condo units are sure to impress. 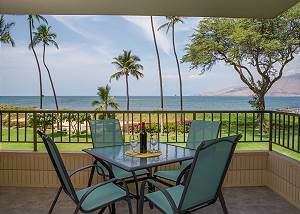 Each condominium is carefully appointed for your dream Maui beachfront vacation and each has their own private lanai. ALL condos have oceanfront views from their lanais. Let yourself get swept away at Koa Lagoon. Tropical breezes and beautiful views in between palm trees will entertain you. With the beach so close you can let your toes sink into the sand and let the refreshing Pacific Ocean wash over you at your convenience. Kihei is a happening town with lots of activities so you can make the most of your time on Maui! Book while you still can at one of Maui's most popular vacation spots! Watch as Hawaiian Green Sea Turtles come up for air and as Whales spout from the edge of our property. Within walking distance is the National Marine Humpback Sanctuary, where you can whale watch with experts, as well as Azeka Place which houses many different dining options and shopping opportunities. The condos are centrally located for you to be able to explore as much as you would like. We are also just down the road from the luxurious Wailea area with championship golf and tennis facilities as well as lavish shopping and dining. Kihei is a great location for anyone from families to honeymoon couples, to anyone wanting to have a fun Hawaiian getaway. Relax at our fantastic pool area or go for a sunset stroll on Maui's longest beach just steps from your stunning Hawaii condo vacation rental. Book the popular Koa Lagoon for an incredible Maui experience!